The propylaia is an imposing structure that marks the entry to one of the most important sites in Athens, the Acropolis. This structure was built during the years 438 to 432 BC under the guidance of Mnesikles and at the time of its construction, it referred to a collection of buildings that had to be crossed in order to enter the temple. With its three Doric columns this structure definitely looked awe inspiring. Although in ruins today, the Propylaia still inspires awe and reverence for the Doric and Ionic forms of architectural styles. The visit to Propylaia is included in the ticket to Acropolis. People normally club together Acropolis and Temple Of Athena Nike while planning their visit to Propylaea. Essentially the gateway to the Acropolis. Quite impressive and really prepared you to enter the Acropolis complex. Don't miss the temple of Athena Nike on the far right, which is a distinct building in the complex. This is the beautiful entrance to the Acropolis. Nice architecture. Be careful with the slippery stones. A propylaea is any monumental gateway in ancient Greek architecture. 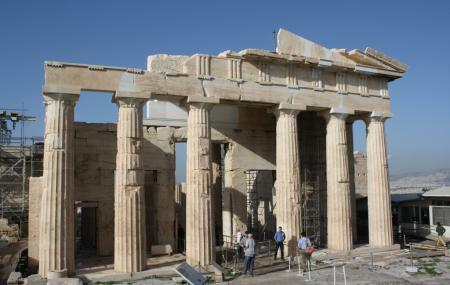 The prototypical Greek example for this is the propylaea that serves as the entrance to the Acropolis of Athens. Unique and very promising entrance to thé Acropolis. Greek used to construct this way and give more importance to the main building coming afterwards. Spectacular views with Thé Parthenon and thé Erechtheion Temple when you advance and a 360 view over Athens and thé complete area when you look back over your shoulder. This was the very impressive entrance to the Acropolis. I think the first time I visited here I didn't pay much attention to it as I was eager to get to the Parthenon, however, this time I used the Rick Steves audioguide and he did an excellent job of describing it and discussing its significance.